Eye conditions such as cataract and astigmatism are very common. In the US, more than 24 million adults over the age of 40 are diagnosed with cataract. One in three Americans have arefractive error known as astigmatism. 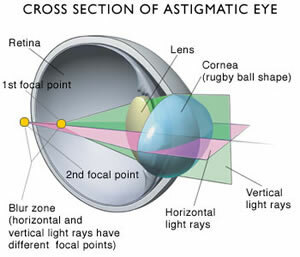 Astigmatism is a condition where there is an imperfection in the shape or curvature of the lens or cornea. The lens has a smooth and even spherical curvature that allows it to focuslight to form clear images. When the curvature is irregular instead of being smooth, light is not focused properly, resulting in blurry images. Corneal astigmatism is when the cornea has an irregular shape, and lenticular astigmatismoccurs when the lens are out of shape. Astigmatism is an inborn condition in most people, and symptoms include headache, blurry vision, strain and squinting of eyes and areas of distorted vision. Both near sightedness and far sightedness (called myopia and hyperopia respectively) can occur along with astigmatism. While many intraocular implants exist to help with both myopia and hyperopia, Toric lens implants are meant for correction of astigmatism. How Does a Toric Lens Work? Toric lens can correct astigmatism as well as near or far sightedness. The shape of the Toric IOL resembles more a doughnut than a sphere of the natural lens. The shape makes it possible to have different refractive powers in different locations of the lens and this fact addresses the defect in astigmatism. A Toric lens implant and cataract surgery is combined to give best results in both addressing astigmatism and removing cloudy lens that occurs due to cataract. Before performing the Toric lens implant procedure, the surgeon takes exact measurements of the cornea to identify the curved location. A diagnostic procedure called corneal topography is done in which the surgeon can calculate exact astigmatism correction that is required. Based on these, the exact power of Toric lens is also determined. The measurements are used to then make the artificial Toric lens. The Toric implants come with special markers which allow the surgeon to rotate and align the lens correctly according to the degree of astigmatism. The exact rotation and alignment of the Toric lens is important to achieve best results. Some residual astigmatism may be experienced by the patient after the implant, especially when the extent of astigmatism is severe. Eyeglasses to read or for distance vision may still be needed. But the depth of vision and focus improves even when not using glasses for those with astigmatism.